If you have a ​small bedroom, you’re not alone – it’s one of the most common bedroom decorating issues. You have to remodel to add actual square footage, but luckily, there are decorating tricks to fool the eye into seeing your bedroom as larger than it actually is. Here are nine bedrooms that show you how to make your room look bigger. When you’re dealing with a small room, think vertical. You might not have much floor space, but by using the walls right up to the ceiling, you use the space you have more efficiently while drawing the eye upwards, making the room seem larger. Built-in shelves that extend from floor to ceiling are a great way to add storage, interest and visual space to a bedroom, but unfortunately, aren’t an option for everyone. You can create the illusion of built-ins with bookcases or shelving units that are tall enough to reach the ceiling or hang enough separate wall shelves to fill the space. Whichever you choose, you’ll make the room look larger by painting the shelves the same color as the walls. Ornate mirror over the dresser. Starburst mirror over the bed. Small, fancy-framed mirrors grouped on the wall. Mirrored or chrome-finished lamps, furniture, and decor. Choose two or three from the list, and watch your bedroom magically "expand" as the mirrors bounce light around the room. 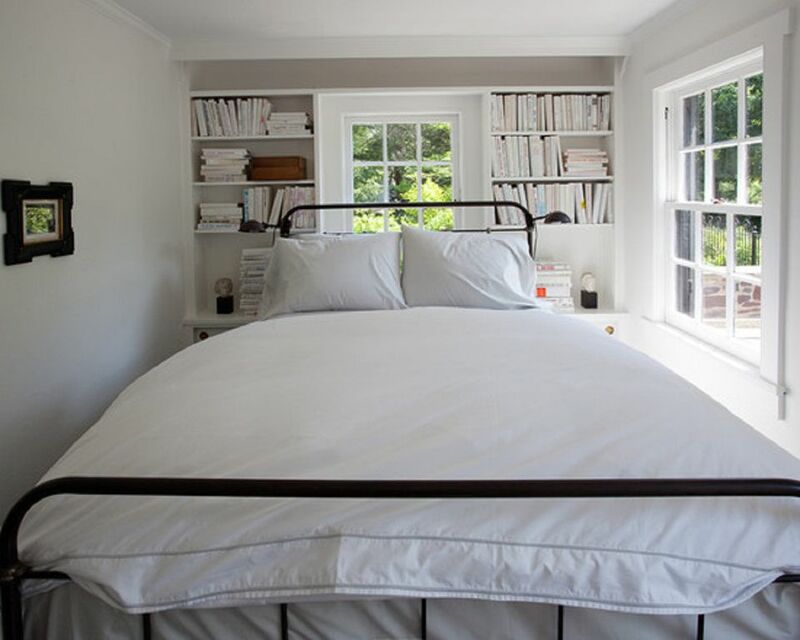 Give your furniture a lift with legs to create an airy, open feel in the bedroom. Not every piece needs to be legged, but try to have at least one piece with some height, whether it’s your nightstands, dresser or bed. The midcentury modern decorating style is especially good for small rooms, as most of the furniture is elevated on thin legs. The more floor and wall that shows, the larger your room will appear. Notice the dresser in this bedroom – the legs aren’t especially tall​ but add just enough height to help enlarge the space. While large bedrooms can make great use of drapes or blinds that contrast with the walls, in a small bedroom, it’s better to match your walls and window treatments. This keeps the eye moving across the space, fooling it into seeing the bedroom as a little bit bigger than it really is. Notice how in the small, gray bedroom shown here, wallpaper adds a bit of pizzazz to one wall, without really contrasting with the painted wall or the drapes. That’s how you add interest without making the space look smaller. Instead of taking up space on your nightstand with ​bedside lamps, install sconces above and slightly to the side of your headboard. This works to draw the eye upward, helps to give the room an open, airy look and reduces visual clutter around your bed. Adjustable sconces are perfect for nighttime reading – just move the light right where you need it, and push it back when you’re done. You don’t have to avoid all prints in a small room, but you’ll make the space look larger if you stick with small prints and plenty of solids. This is especially true on your bed, which is generally the largest item in the bedroom. Choose a solid or mostly-solid bedspread or comforter, then add some color and interest to​ printed sheets and throw pillows. Stick with light-to-mid tone colors to help visually enlarge the space. The bedroom shown here has plenty of texture and pattern, but because the palette is confined to white and tan, there is interest without a closed-in feeling. Nothing makes a bedroom look as small and cramped as clutter. One of the easiest ways to open up your space is with a good purge – get rid of excessive knickknacks, items that belong in other rooms of your home, and anything that is unneeded or unattractive. You don’t want a bare, sterile room, but you don’t want overload either – instead, find the happy medium with just a few pieces of artwork, photos, collectibles, or other accessories. A small room doesn’t have to mean tiny furniture, but it does mean that you’ll need to find pieces that match in scale and are sized appropriately for your space. A king-sized bed flanked with two tiny nightstands looks silly. 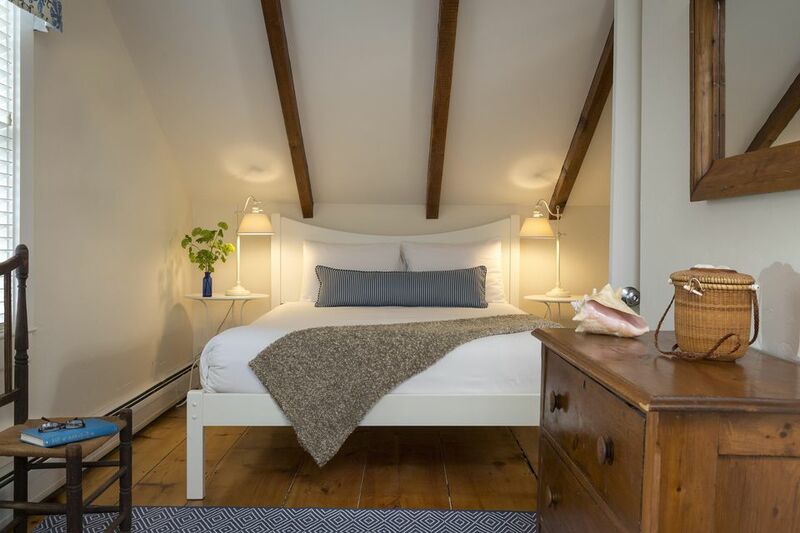 Instead, choose a bed size that allows you to fit at least one nightstand large enough to hold its own beside the mattress, as in the bedroom shown here. Your dresser should match the nightstand in scale – often a dresser that is tall and narrow works better than a wide, short piece in a small room. You’ve probably heard that white opens up a room, and that is generally true. But that doesn’t mean that your bedroom needs to resemble an operating room. You don’t need to decorate in all white, but it helps to stick with a soft, light palette. Pastels work wonderfully in small rooms, as do whispery-light shades of gray. Try white mixed with one bright or mid-tone color, such as the blue and white shown here. For the most impact, stick with cool colors – shades of soft blue, green and purple help enlarge a space, while the warmer hues have the opposite effect.